This handbook provides an up-to-date account of hydrosilylation reactions and the directions in which synthetic and mechanistic studies as well as practical applications of these processes are proceeding. The book consists of two parts: the first is descriptive, presenting the catalytic, mechanistic, structural and synthetic aspects of hydrosilylation, as well as its application in organic and organosilicon chemistry. The second part, presented in tabular form sets out encyclopedic information concerning reaction conditions taken from more than 2000 papers and patents in the period 1965 - 1990. For chemists interested in the synthesis of organosilicon and organic compounds; industrial chemists interested in the application of such compounds, as well as physical chemists interested in the reaction mechanisms and catalysis. Chapter headings and selected sections. Introduction. Catalytic Aspects of Hydrosilylation. Free-radical addition. Methods of silyl radical generation. Hydrosilylation of the C=C bond: mechanism, stereochemistry and examples. Addition of silicon hydrides to other multiple bonds. Nucleophilic-electrophilic catalysis. Homogeneous catalysis by transition metal complexes. Catalysis by supported transition metal complexes. The Reactivity in Hydrosilylation of Particular Types of Organic Compounds With Multiple Bonds. Hydrocarbons with an isolated C=C bond. Dienes with isolated double bonds. Alkene and cycloalkene derivatives with functional groups. Alkyne derivatives with functional groups. Saturated carbonyl compounds. Unsaturated carbonyl compounds. The Effect of Substituents at Silicon on the Reactivity of the Si-H Bond in Hydrosilylation. Effect of the structure of silicon hydrides on the rate and yield in hydrosilylation processes. Influence of the structure of the silicon hydride on regio- and stereoselectivity in hydrosilylation. Practical choice of silicon hydride in the hydrosilylation reaction. The Hydrosilylation of Unsaturated Organosilicon Compounds. Addition of substituted hydrosilanes to carbon-carbon double bonds in unsaturated silanes. Curing organosilicon polymers by hydrosilylation. Intra- and intermolecular hydrosilylation. The Application of Hydrosilylation Processes. Silanes as coupling agents. Reduction of organic compounds by hydrosilylation. Modification of polymers via hydrosilylation. 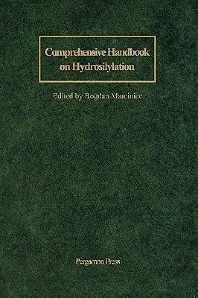 A Compilation of Information on Hydrosilylation Studies Over the Period from 1965 to 1990. List of tables. Abbreviations. Tables/Figures.Bibliography. Reviews. Papers. Patents. Index.